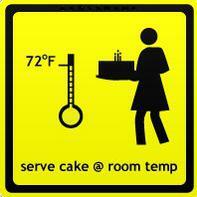 Serve cake at room temperature? Does Pineapple Bakery recommend refrigeration on cakes and cupcakes? Yes, we follow the health department guidelines for handling dairy and freshly made pastry creams and curds. Cupcakes are best served the same day of purchase at room temperature. Cold versus room temperature, does it matter? How long will it take to hit room temperature (72 degrees)? 5 - 15 minutes for cupcakes and slices. Allow two hours for cakes. The larger the cake, the more time that is required. Remove from box and set on counter. How long can a perishable cake sit out at room temperature? Food stored between 40 degrees and 140 degrees can be left out at 72 degrees for 2 hours. Your cake will come to that temperature in about 2 hours, then left at room temperature for 1 - 2 more hours for a total of 3 - 4 hours, depending on the size of the tier. How do I bring a fondant covered cake to room temperature that has been refrigerated overnight? If a Fondant covered cake is refrigerated because it contains perishable items, as soon as it is removed and exposed to the warmer room temperature air, moisture MAY condense on it's surface. It usually becomes shiny. This happens because of the temperature differential between the refrigerator and the room's air. Condensation is not good because it is moisture that will essentially "dissolve" the sugar-based Fondant. Sugar is a humectant, which readily attracts the warm moisture from the air. To prevent condensation from forming, as soon as you remove the cake from the refrigerator, it's best to place it in an air conditioned (low humidity) environment to "warm up". It takes awhile so allow plenty of time. Since the temperature / moisture differentials between the cake and the air aren't so great, the condensation is lessened or eliminated. You can also place the cake in front of a fan to dry up the moisture. Remember to rotate the cake often and allow a good hour or more before set-up/presenting the cake. If the weather is hot and humid and the Fondant covered cake sweats and does not contain perishable items, store cake in a air conditioned room. It removes some of the moisture from the air making it a good environment.